on Washington State and that to save the orcas we need to take bold actions. Her grief is beyond words. 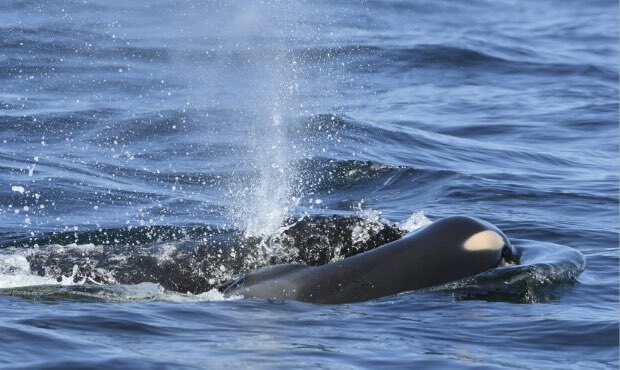 Just over two weeks ago, southern resident orca J35 gave birth to a baby that died within 30 minutes. Shortly after her own birth 20 years ago, J35 was given the name Tahlequah, a direct connection to the Vashon Island waters she visited in the earliest days of life and where she and her family still come looking for salmon each fall. I started tracking and monitoring the whales a year before J35 was born. It was my first step into environmental work and led to my role with Preserve Our Islands as we fought to protect the Maury Island shoreline with work that included suing the federal agencies for their failure to protect the orcas under the Endangered Species Act. When the battle for Maury Island was won, the organization reformed as Sound Action and now works throughout all of Puget Sound using our well-honed skills to tenaciously enforce environmental laws and protect nearshore habitat and species. As I write this, Tahlequah -- who I first saw as a young calf -- has now been carrying the body of her daughter for 17 days, surrounded by the rest of her family in a mourning procession. When the baby falls off, her mother dives deeply to bring her back. Over and over again. Adding to this heartbreak is the fact that this loss has become the norm for the whales with 70 percent of all recent pregnancies ending in miscarriage or early death. There is no mystery as to why this is happening. It's because the mothers don't have enough food to support a successful pregnancy. And it's not just the babies that are dying. The adults are also starving to death, and 50 whales have been lost since first being listed as endangered. With just 75 of the southern residents left, the population is the lowest in 30 years. As we watch J35 on what some have called her parade of grief, tear-filled eyes are also on the 4-year-old orca calf known as J50 or Scarlet, now emaciated and on the edge of survival. Scientists are urgently trying to save her by taking the unprecedented step of giving her medicine and making "out of the box" plans to feed her by putting chinook salmon, the preferred prey source, directly in front of her to eat. While these efforts are commendable, it should have never come to this point of desperation because, for decades, state and federal agencies tasked with protecting the whales and their habitat have known the orcas were starving to death due to chinook populations all but disappearing. But despite scientists, environmentalists and the whales themselves ringing alarm bells and urgently asking for action, the regulatory agencies did nothing. As a result of this failure, the southern resident orcas are on the brink of extinction, and absent a near-term increase in salmon, may have already been lost. Several months ago, Governor Jay Inslee signed an executive order directing state agencies to take action to help the southern residents and creating a task force to address threats to the whales, including lack of prey, contaminants and vessel disturbance. Sound Action has been a part of this effort, working as a member of the prey availability work group responsible for putting together actions to increase chinook availability for the task force to consider. Since May, I've spent countless hours at meeting tables talking about salmon and orcas. While I applaud Gov. Inslee's leadership and call to action, there have been concerns this would be another feel-good exercise with no meaningful change. I have shared this worry because we already have countless studies, plans and recommendations that were painstakingly put together only to sit on a shelf while the chinook and orcas continued to slip away. And indeed, up until last week, the task force trajectory seemed pointed toward a report that would be a watered down version of what is actually needed for orca recovery. But J35 raising her flag of grief and J50 starving before us may have been a game changer. Last week, at a meeting along the Columbia River, a waterway critical for producing chinook, the governor called in to tell the task force the eyes of the world were now on Washington State and that to save the orcas we need to take bold actions. The task force co-chairs shed tears when addressing the room, and dozens of organizations and members of the public traveled through roads filled with wildfire smoke into 100-plus degree temperatures to stand up for orcas by asking the task force to make a range of decisions that may be uncomfortable or controversial, but necessary. This will mean quieting vessel noise and keeping whale watching boats father away from the whales so they can better echolocate salmon. It means taking out the Lower Snake River dams, something experts have long determined would result in a significant increase of chinook for the whales. It means we have to stop allowing contaminated stormwater to go into the Salish Sea, and it means that permitting agencies need to say no to permits allowing nearshore development that kills habitat for the chinook. Right now, we have a sliver of hope and a painfully narrow window of time to hopefully bring the orcas back from the fate of extinction, but any chance of success will require actually taking the bold actions and not just talking about them. As Gov. Inslee has said: The world is watching. Amy Carey is the executive director of Sound Action.